This is an article published in the Washington Post but thought I would post here as well as well. Comments welcome! There are multiple comments and replies there. How to best teach reading is one of the most controversial topics in education. The controversy concerns whether early instruction should focus letter-to-sound correspondences so that children can learn to sound out words (systematic phonics) or focus on the meanings of written words embedded in stories (whole language). This debate started decades ago and shows no signs of ending. What might not be so apparent to an outsider, however, is that there is near universal consensus in the research community that systematic phonics is the more effective approach. At this point, the controversy is largely between the research community and teachers in the classrooms who often prefer whole language. As a parent or teacher, who should you trust? The sad truth is that both camps have it fundamentally wrong. 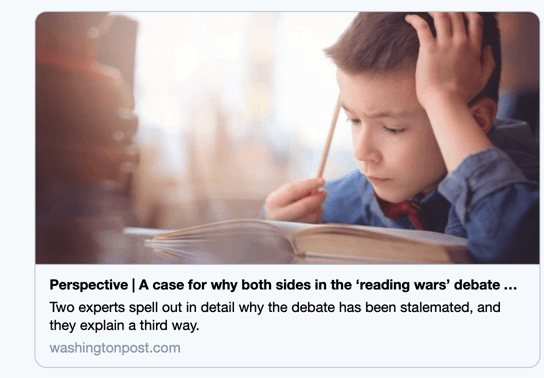 As we show below, the so-called “reading wars” that pits systematic phonics against whole language has turned out to be a big distraction that has made it difficult for researchers and teachers to objectively look at the evidence and consider alternative approaches. After explaining why neither approach is supported by data or theory, we make the following proposal: Children should be taught how the English spelling system works (hint, it is not what you think). As background, it is necessary to understand a bit about the similarities and difference between the two competing approaches. Systematic phonics explicitly teaches children letter-sound correspondences prior to emphasizing the meanings of written words. It is called systematic because it teaches letter-sound correspondences in a specific sequence as opposed to incidentally or on a ‘when-needed’ basis. Several versions of systematic phonics exist, but the most common version (the version mandated in the UK) is called synthetic systematic phonics, and it teaches children the sound of letters in isolation and then coaches students to blend the sounds together. For example, a child might be taught to break up the written word <dog> into its component letters, pronounce each letter in turn—/d/, /ɔ/, /g/— then blend them together to form the spoken word “dog”. Whole language teachers typically provide some instruction in phonics, usually as part of invented spelling activities or through the use of graphophonemic prompts during reading (Routman, 1996). However, their approach is to teach it unsystematically and incidentally in context as the need arises. The whole language approach regards letter-sound correspondences, referred to as graphophonemics, as just one of three cueing systems (the others being semantic/meaning cues and syntactic/language cues) that are used to read and write text. Whole language teachers believe that phonics instruction should be integrated into meaningful reading, writing, listening, ands peaking activities and taught incidentally when they perceive it is needed. As children attempt to use written language for communication, they will discover naturally that they need to know about letter-sound relationships and how letters function in reading and writing. When this need becomes evident, teachers are expected to respond by providing the instruction. So the reading wars debate is not about whether or not children need to learn about letter-sound correspondences. Rather, it is about how and when these correspondences should be taught, and in what context. According to proponents of systematic phonics, letter-sound correspondences need to be taught systematically and first as this provides the means by which meaning can be accessed from written words. By contrast, according to the proponents of whole language, meaning plays an essential role in reading instruction from the start. On this later approach, a combination of meaning-based instruction with unsystematic phonics is the more effective method. So who is right? “Students taught systematic phonics outperformed students who were taught a variety of nonsystematic or non-phonics programs, including basal programs, whole language approaches, and whole word programs. (p. 2-134)”. “Having considered a wide range of evidence, the review has concluded that the case for systematic phonic work is overwhelming …” (Rose, 2006, p. 20). “… there are few topics in educational psychology that have been more thoroughly studied, and for which the data are clearer… it’s clear that virtually all kids benefit from explicit instruction in the [letter-sound] code, and that such instruction is crucial for children who come to school with weak oral language skills”. (2015, p. 124). It should be clear that I am advocating here a strong ‘phonics’ approach to teaching, and against a whole-word or whole-language approach… theoretical and laboratory-based arguments converge with school-based studies that prove the inferiority of the whole-word approach in bringing about fast improvements in reading acquisition. (Dehaene, 2011, p. 26). Given all this, how can we responsibly challenge the evidence taken to provide strong support for systematic phonics? As we show below, when the empirical evidence is viewed dispassionately rather than as a weapon in the reading wars, the case for systematic phonics quickly unravels. First, consider the National Reading Panel (2000) meta-analysis that combined the results from 38 published experiments that compared various methods of reading instruction. This report continues to be the most cited document in support of systematic phonics over whole language, but a careful reading of the document reveals that it did not even test this hypothesis. We need to get a bit technical here to explain why this is the case, but it is important to understand this point as it undermines the most important evidence in support of systematic phonics. The bold highlights the key point that systematic phonics was compared to a control condition that combined two separate conditions, namely, (1) intervention studies that included unsystematic phonics and (2) intervention studies that included no phonics. Where does whole language fit into this meta-analysis? Whole language was just one of many alternatives programme that were merged together into a single control condition. Specifically, the whole language interventions were combined with “balanced literacy”, “whole word”, and other forms of alternative programs that included unsystematic or no phonics. The key finding from the National Reading Panel was that systematic phonics was more effective than the average performance in the control group that included various forms of reading instruction. As elementary point of logic, if you compare systematic phonics to a mixture of different alternative methods, only a subset of which are whole language, then you have not tested systematic phonics compared to whole language. More importantly, when Camilli et al. (2006) reanalyzed the National Reading Panel (2000) dataset and directly compared systematic to unsystematic phonics (excluding studies that had no phonics, such as “whole word” interventions), the advantage for systematic phonics was greatly reduced, and no longer statistically significant. This undermines the claim that systematic phonics is more effective than whole language instruction that includes unsystematic phonics. Nevertheless, this finding has largely been ignored. The National Reading Panel has been cited will over 22,000 times, and over 2000 times since 2017. By contrast, the Camilli et al. (2006) paper has been cited a total of 58 times, and only 9 times since 2017 (with 3 of these citations coming from us). This conceptual confusion persists. Bowers (2018) shows that every subsequent meta-analysis taken to support systematics phonics over whole language has made the same mistake of comparing systematic phonics to a mixture of different methods, or comparing systematic phonics to interventions that included no phonics. Accordingly, none of these meta-analyses should be taken to support systematic phonics over whole language. Moreover, Bowers (2018) points out a host of additional fundamental problems with these meta-analyses that further undermine this conclusion. There really is little or no empirical evidence to support the conclusion that systematic phonics is best practice. The fact that this claim is repeated 1000s of times in the literature does not make it so. But it is somewhat of a scandal that the research is so consistently misrepresented in the literature. This is no victory for whole language either. The two approaches appear to be equally good (or bad) at improving reading in schools. If you are not happy with the outcomes of whole language, you should similarly be unhappy with the outcomes of systematic phonics, and vice versa. This is the conclusion we draw, and we hope it motivates researchers and teachers to consider alternative methods of reading in the US (where whole language is still commonplace), in England (where systematic phonics has been the norm since 2006), and every other English-speaking country. Proponents of systematic phonics also appeal to theory in support of their approach. Indeed, they are quick to ridicule the theoretical motivation for whole language, and with good reason. According to foundational theory for whole language, learning to read is just like learning to speak (Goodman, 1967). Given that virtually everyone from every culture learns to speak without any formal instruction in a context of being exposed to meaningful speech, it is concluded that children should learn to read in the same way, naturally, by reading meaningful text. The fact that not all verbal children learn to read with whole language should be a first clue that something is wrong with this theory. But the theory for phonics also is fundamentally flawed. The standard claim is that English is an “alphabetic system” in which letters represent sounds, and this in turns motivates systematic phonics given that it teaches these letter-to-sound mappings. On this view, it is just an unfortunate fact that the English spelling system includes so many exception words (or “sight words”). The linguist David Crystal (2003) estimates that the phonics can only explain about 50% of English spellings. Question: Why is there a <g> in <sign>? Why is it <dogs> with an <s> rather than *<dogz> with a <z> given that we pronounce <dogs> with a /z/? Why is <does> spelled as it is instead of *<duz>? Why is it <Christmas> not <Chrismas>? Answer: Because English spellings are crazy. How should children learn these exception words? Remember them by rote. In response to the crazy system, some proponents of systematic phonics use “decodable texts” that are composed of regular words, leaving all the irregular words (e.g., dogs, does, because, two, here, gone, action, jumped, Christmas, etc. ), and all the wonderful children’s books, for later. Perhaps the most straightforward sign that there is something wrong with alphabetic principle is the observation that most homophones (words with the same pronunciation but with different meanings) are spelt differently (e.g., <to>, <two>, <too>). If English followed the alphabetic principle, then the obvious prediction is that most homophones should be spelt the same way. How to explain the failed prediction? Should we just shrug our shoulders and conclude that this is one of those cases in which the (many) exceptions prove the principle? Let us suggest another possibility, consistent with Venezky, namely, English spellings encode the interrelationship between sound and meaning. On this hypothesis, the different spellings of homophones mark the fact that the words have different meanings. Very briefly, to illustrate how the English spelling system encodes meaning, consider the morphological families associated with the bases <act>, <do>, and <go> in the Figure below. 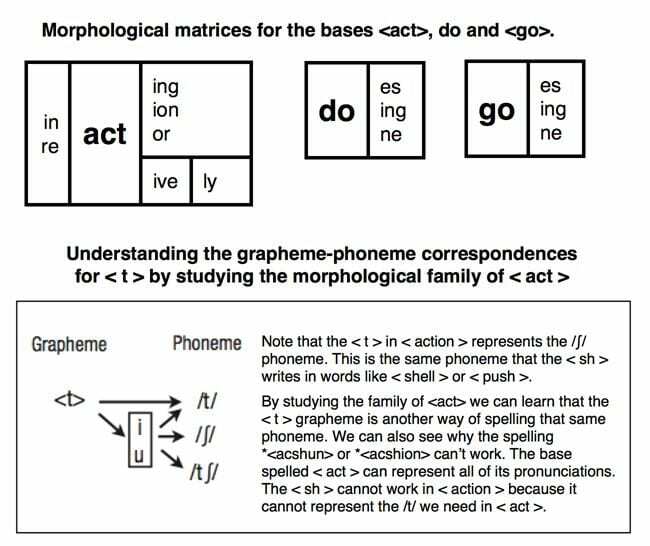 The key point to note is that the spellings of the bases are consistent across all members of the morphological families despite pronunciation shifts (e.g., acting vs. action; do vs. does; go vs. gone). Similarly, note the consistent spelling of the <-ed> suffix in <jumped>, <played>, and <painted> despite the fact that <-ed> is associated with the pronunciations /t/, /d/ and /əd/, respectively. The spellings of <action>, <does> and <gone> make sense once you understand that spellings also encode the meaning. These are not cherry-picked examples. As the linguists Venezky (1967) and Carol Chomsky (1970) explained, English prioritizes the consistent spelling of morphemes over the consistent spellings of phonemes. This is true for words that occur in adult novels and children storybooks that both include of a high percentage of morphologically complex words (Bowers & Bowers, 2018b). A language that prioritizes the consistent spelling of morphemes over phonemes is not following the alphabetic principle, and it raises questions about teaching methods that ignore this structure. Once you understand the English spelling system, it makes no sense to consider <goes> regular and <does> irregular, as claimed with systematic phonics. We expect teachers of physics, mathematics, biology, etc. to understand the basics of physics mathematics, and biology. Here is our proposal: Teachers should know the rules of the English writing system when teaching children to read and write English. Children can be taught letter-sound correspondences AND the regular way that morphemes are spelt. This does not need to be complex at the start: Children can learn why the words <dogs> and <cats> have the letter <s> at the end despite the different sounds at the end. Children can study relevant words organized in morphological families (as in the matrices above) so that they learn how words are related to one another, both in spelling and meaning, in order to improve their reading, spelling, and vocabulary. Structured Word Inquiry (Bowers & Kirby, 2010) is an instructional that approach that teaches morphological families with the help of the matrix and explicitly teaches letter-sound (grapheme-phoneme) correspondences in that context, as well as historical (etymological) influences that make sense of spellings. Proponents of both systematic phonics and whole language can find central aspects of their instruction in structured word inquiry. Like systematic phonics, this approach breaks down words into parts, but rather than just focusing on one set of regularities (letter-sound correspondences) it highlights all regularities (including the fact that morphemes are spelt consistently, and the way that morphemes are combined in regular ways). And consistent with whole language, it emphasizes the importance of meaning from the start with the aim of making early reading instruction interesting, but it focuses on meaning words rather than text. But structured word inquiry does not simply combine aspects of phonics and whole language. Rather, it is built on the insight that the English spelling system is logical and makes sense, and that children can learn the system by testing simple hypotheses about words – much like learning other scientific disciplines. Unlike systematic phonics and whole language that provide little or no explanation for most sight words, children can learn why a word is spelt the way it is, learn how letter-sound correspondences occur within morphemes, and learn how morphologically related words share spellings and meaning. Nothing motivates learning like understanding. Our proposal is not mere speculation. There is preliminary evidence that teaching morphology and the logic of the writing system is effective for initial reading instruction, as summarized by Bowers and Bowers (2017). But it has to be acknowledged that the data for our proposal is limited. In large part, this is because there has been so much focus on the phonics vs. whole language debate that few researchers have considered alternative approaches. It is long past time to move beyond the reading wars and explore the possibility that children should be taught the meaningful and logical organization of their writing systems. Parents might learn something too. Bowers, J.S., & Bowers, P.N. (2017). Beyond Phonics: The Case for Teaching Children the Logic of the English Spelling System. Educational Psychologist, 52, 124–141. Camilli, G., Vargas, S., & Yurecko, M. (2003). Teaching children to read: The fragile link between science & federal education policy. Education Policy Analysis Archives, 11, 15. Dehaene, S. (2011). The massive impact of literacy on the brain and its consequences for education. Human Neuroplasticity and Education (Vatican City), 117, 19 –32. Goodman, K. S. (1967). A psycholinguistic guessing game. Journal of the Reading Specialist. 6, 126–135. Hi Harriett, thanks for your nice comments. Regarding whether English is analphabetic system, the point is whether letters are only designed to represent phonemes (like in shallow orthographies) or whether letters are designed around phonemes and meaning. There is no question that English spellings are organized around both, making it a morphophonological system. It is not only that spellings are influenced by meaning, the English spelling system prioritizes the consistent spelling of morphemes over phonemes, which explains why there are so many “irregular” words. The fact that there is a in is a feature rather than a bug of the system – in order to spell consistently in and , etc. The prioritization of meaning is also reflected in the fact that most homophones are spelt differently – just the opposite as you would expect if English followed the alphabetic principle. I am however not in agreement with the proposition that “English is not an alphabetic language”. I think everyone needs to be careful about over-generalisations in this space. It is not like Italian or Spanish, but neither is it random. I have referred in previous blogposts to the work of Louisa Moats (2010) who draws on the earlier work of Hanna et al (1969) to point out that some 50% of words in English are directly decodable from their written form and a further 36% violate only one sound–letter rule (usually via a vowel), 10% can be spelt correctly if morphology and etymology are taken into account and fewer than 4% are truly irregular. And of course, for beginning readers, it makes sense to start with examples that do show this 1:1 correspondence as a “way in”.